The primary way to alleviate electrical encoder noise is to use TTL output – also known as differential line driver output. This output format provides not only the standard A and B square wave signals and a Z reference signal, it also includes their complementary signals, /A, /B, /Z (sometimes written as A’, B’, and Z’). These complementary signals are produced by splitting the output of each channel (A, B, and Z) into two signals that are 180 degrees out of phase (complements) with each other. In other words, when the A signal is high (logic state 1) the A’ signal will be low (logic state 0). The receiving electronics take the state of that channel as the difference between the two signals. In order for the complementary signals to be read, however, the receiving electronics must have a circuit that is designed for differential input – known as line receiver input. In addition, the wires for each channel (A and A’, for example) should be a twisted pair. In this twisted pair of wires, any electrical encoder noise that is induced will be the same on each signal. 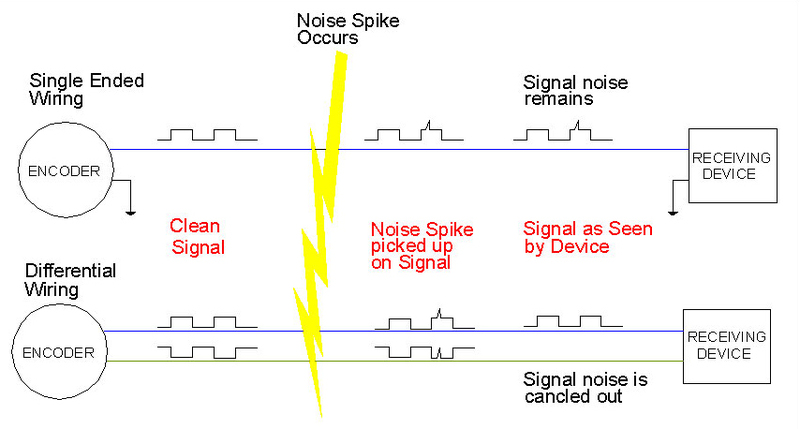 The receiving electronics recognise only the difference between the two signals, and because the signals are complements (equal in magnitude, with 180 degree phase lag) but the noise is common mode (equal on each signal, with no phase lag), the noise is cancelled out on the receiving end. electronics, and the availability of improved sensors for motor control. The brushless motors, independently whether they are PMSM or BLDC motors, require to know the relative position of the windings with respect the motor poles. To do this, a set of Hall Effect sensors are typically employed and placed between windings. An alternative option is to use the positional feedback from more accurate sensors to determine the presence of the magnetic field without using Hall Effect sensors. However, an intelligent drive is required to perform this count and issue the signal that conmutates the phases. This action is performed automatically with the bipolar Hall-Effect sensors. For the majority of applications in the US and Japan, the trend in brushless motor sensor designs is moving away from Hall boards and feedback elements to integrated devices. For resolver applications, it can be handled by adding a dedicated set of 2, 3, or 4 speed windings for commutation, or it can be handled with a single speed winding and an intelligent drive. The elimination of the Hall sensors from the BLDC motor eliminates many of the potential problems which can occur in a motor application. Hall devices are sensitive to acoustic noise, current spikes, temperature, EM fields, and can be difficult to align, which results in torque ripple. When a BLDC motor is used in a servo application with a high resolution feedback sensor, Hall sensors are redundant and consume space. They also add to motor length, assembly costs, cable harnessing complexity, and decrease overall reliability. The use of an encoder or resolver to eliminate Hall sensors in this situation is not only cost effective, but also improves the overall system performance. When an encoder is used as the feedback element, there are a variety of types to choose from. The following is a short summary of the predominant types currently available. Becoming more common in the US and Japan, availability is somewhat constrained by lack of industry standards. Mounting configuration, signal conditioning, and power supplies vary widely. Available in line counts up to 8000 for 2, 4, 6, and 8 pole motors. They are being developed in both hollow-shaft and modular versions by a variety of encoder suppliers. outputs, with a 1 volt pk-pk amplitude. Commutation is accomplished using a quadrature one cycle per revolution output. Less common for drive applications, these are usually found in 10 to 12 bit versions. Larger word sizes are available, but costs become a real issue and make them unsuitable for all but the most specialized applications. These encoders are generally based upon a 12 or 13 bit single turn absolute encoder, with a 12 bit turn counter yielding 24 or 25 bits of position information. Although these have been available for some time, they have been too costly for widespread applications. Recent developments in Europe, however, are making these more available, and costs are starting to come down. These encoders contain an incremental output with A, B, and Reference pulse, a serial absolute interface, and commutation outputs. Commutation output is derived from the MSB of the single-turn absolute. The Incremental tracks are derived from the LSB of the absolute encoder, and generally result in a 2048 or 4096 cycles per revolution incremental signal that is suitable for use in high-speed servo controls. One of my mates is developing several projects related to robotics which are worth mentioning. In his blog, one of his last projects is the construction of an humanoid robot based on steppers. There is a trend in robotics towards the use of backdrivable actuators due to multiple reasons. One of them, is the need of sharing the environment with humans. Such a robot needs flexibility to adapt the differences between real environmental condition and assumed environmental condition. The robot´s joints may need to be articulated by a human and that would require high backdrivable actuators with low friction. There are many other applications where a backdrivable actuator is needed, for example, in teleoperation, when Position-Position control is implemented. In teleoperation, a master device is controlled by a human operator and a slave device placed in a safe area mimics the movements of the master device. Position-Position uses the difference in position between master and slave to calculate the feedback forces to the operator. The more the positional error, the greater the forces. This positional error would be much more reduced with non-backdrivable actuators, and then, more difficult to provide feedback to the operator. At the end of the day, what you want in your slave device is to behave like a human, to react to the external forces as a human would do. If having a very stiff slave, the positional error would be minimum in normal tasks and the operator would not feel anything. In any circumstance where the estimation of the external forces is needed, a backdrivable actuator is preferred. This could also be the case of walking robots, where it is important to feel the impact between the leg and the ground and react accordingly with a determined compliance. Backdrivability is essential for safe robotic-arm operation around people; operating in unstructured environments; for stable control of contact forces; and for exploiting Jacobian-Transpose safely to enable Cartesian control of forces, haptic objects, and direct Cartesian control of trajectories. Backdrivability is the ability for interactive transmission of force between input axis and output axis. To get high backdrivability, we have to reduce friction of power transmission considerably. Backdrivability provide actuators with high force sensitivity and high impact resistance which adapts to quick external force mechanically. In rehabilitation robotics, particularly in upper limbrobotics, the drives must be able to deliver high torques at low velocity. Therefore, many rehabilitation robots are driven by motor-gearbox combinations. In contrast to direct-drive motors, the backdrivability of geared drives is poor due to friction in the gearbox. The back-driving torque sb can be defined as the amount of torque the human must apply to the robotic joint in order to perform a user-driven movement. Perfect backdrivability is achieved if sb = 0. In  it is suggested that a reduction ratio over 60 in harmonic drives creates non-backdrivable actuators. The backdrivability of a gearbox is highly correlated with the friction and the efficiency. Hence, let us have a look to the efficiency of different types of gears to get a initial impression of the backdrivaility of them. In  a comparison between Harmonic drives and Cycloid drives is shown. In their research, Cycloid drives fitted into the same package diameter as harmonic drives with equal torque-generating capabilities. In their research, they demonstrated many advantages over harmonic drives, including substantially greater efficiency (especially at low torques) and lower reflected inertia, and often provided a thinner profile. These benefits were offset, however, by substantial disadvantages, including significant backlash and gear ratio ripple. They conclude that, neither Cycloid nor harmonic drives are universally superior for all applications and conditions. However, Cycloid drives should be considered for applications in anthropomorphic robots and prostheses, especially those in which size, inertia, and efficiency take precedence over backlash and torque ripple. Double helical gear drives are considered to be more efficient than single helical gears. Instrumented Harmonic Drives for Robotic Compliant Maneouvres. H. Kazerooni. In this post I am going to review the main parameters affecting the selection of the correct motor and gears for your application. Motors are a very common component in many devices and embedded systems. To function properly, their selection requires a careful step by step process that relies heavily on the intended operation of the motor. Therefore, before motor selection can begin, it is beneficial to define what the motor will have to do, the performance goals of the motor and overall system (i.e. how will you measure that it’s doing well), and how the motor will interact with the other system components (such as the power system). Understanding these parameters will help the selection process by keeping the focus on what your system must achieve, and in turn can help you to better define motor technical requirements. This post and the following will use a wheeled robot in order to illustrate the process to be followed on the determination of a motor. In the next sections, these steps will be review and explained with examples of application.